This week, we spoke with Nani Ferreira-Mathews. 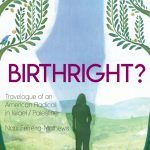 Nani is the author of “Birthright? : Travelogue of an American Radical in Israel / Palestine”, published by On Our Own Authority (or OOOA) Books, out of Atlanta, earlier this year. Nani has indigenous Hawaiian and Jewish heritage and talks and in 2013 went on the Taglit-Birthright tour to Israel, which is offered to Jews raised outside of Israel, in this case mostly of those on the trip were from the U.S., Canada & Europe. Going into it, she already had some misgivings but throughout the tour she became more and more aware of the trip as a means to erase Palestinian and Indigenous perspectives from visibility to the tourists, who are being groomed for populating the spaces seized by the Israel as a Jewish-only territory and state. We talk about Zionism as a nationalist movement, the manipulation of the tourists on this free trip including setting up romantic situations among the guests and IDF soldiers and sleep deprivation, funding sources for Taglit-Birthright, and comparisons between the erasure or commodification of non-hegemonic ethnic and religious identities in the history and culture of the United States of America and Israel. We also talk about the BDS (or Boycott, Divest, Sanction) movement, a Palestinian-led protest movement to economically and culturally push Israel to end the occupation. Next week we’ll be airing a conversation with activists working on political prisoner and human rights issues in Palestine, so stay tuned! Jewish Voices For Peace national where you can find info about specific chapters. In an update to the International Days of Action against Fascism and Anti-Semitism that we read an announcement from last week, in the crimethInc HotWire weekly podcast #43 from last week you can hear an interview with members of the Outlive Them Network who are calling for the day as well as an anarchist from the Tree of Life synagogue where the terrible anti-semitic attack happened in Pittsburgh last week. Also, though this didn’t make the audio for this week, the ItsGoingDown podcast #38 from early November also includes an interview with an anarchist involved in If Not Now, an anti-Zionist organization of young, American Jews. This is also not the first time that the current voices on top of this garbage pile that we call a government have utilized othering strategies to further attempt to divide and stratify the thinking regarding non white, non cis, and non papers having folks. We don’t have to think very far back for examples of this kind of behavior, and I don’t really think that they bear repeating here. Back to the laws tho, citizenship as we know it is a very problematic structure. It is so closely wrapped up in colonialism and overwhelming biases toward the wealthy and white so as to be practically indistinguishable. If any of the components which make up citizenship were to be in any way compromised, the whole system might topple. It’s colonizer nature, which is at the same time very established with many supporting structures but also very fragile and riddled with internal contradictions, is also to point here: the US government in our view should not have the right to determine who is legitimate on stolen land. If you or someone you know have a perspective on citizenship which is anti colonial and would like to talk about it with us for a future radio piece, please get in touch at thefinalstrawradio@riseup.net or tfsradioshow@protonmail.com and make the subject heading “Anti Citizenship”. We’re seeking to trouble and nuance this conversation in any way and would love to hear from you! Seven people incarcerated in Toledo Correctional Institution went on strike Saturday, November 2nd). They refused to be moved into the yard for recreation time until a SWAT or SRT team moved them, and are going on hunger strike and refusing food. SWAT and SRT teams have used rubber bullets against protesters in Toledo before. They are protesting renovations to add more solitary confinement wings. In the past 2 months, the state has been trying to turn the entirety of Toledo into a lockdown institution. As a result, people have been sent to solitary because other units didn’t have room, and for minor infractions that wouldn’t have been reason to send someone to solitary confinement otherwise. Call to protest the expansion of solitary confinement, racist harassment, and the denial of food at the whims of abusive officers. On Saturday, prisoners were maced and refused the ability to wash the chemical weapons off of their body overnight. The details of this callup can be found, including numbers and more, at the IWOC website.